Walt Disney's True-Life Adventures series ended in 1960 with the film Jungle Cat, but it was far from the end of Disney films starring live animals. In 1957, he produced a film called Perri that was advertised as a "True-Life Fantasy" because it was actually based on a book. He used his True-Life film crew to capture staged scenarios with animals to tell a story, and that is exactly what Nikki, Wild Dog of the North is. Two film units were set up in Canada for this film, one of which was headed by Jack Couffer who receives full director credit. Winston Hibler, producer of most of the True-Life Adventures, produced and co-wrote this film. The source material was a book called Nomads of the North by James Oliver Curwood. The film begins with opening credits against footage of Canada's beautiful landscapes. The story begins with a trapper named Andre Dupas and his domesticated wolf dog Nikki. When Nikki runs off, he discovers an orphaned bear cub named Neewa. Andre ties them together as they take off down the river, but they are tumbled out of the canoe when they get to rapids and Nikki and Neewa must fend for themselves. They do alright until Neewa hibernates for the winter and Nikki begins to grow hungry since he is not a natural hunter. He learns how to trick hunter traps and begins to steal meat that was meant for bait. The hunter gets angry and poisons the meat. He and his Indian guide follow Nikki's tracks and trap him, but a wolf comes and they witness Nikki defeat the wolf that attacks him. The hunter decides to train Nikki as a dog fight dog by being cruel to him and making him hate everybody, including humans who he was always kind to. After training Nikki, the hunter learns that dog fights have been made illegal, but continues the fights anyway. The town factor arrives to break up the fight and the hunter pushes him into the dog pit hoping Nikki will attack him, but it turns out the factor is Andre, who Nikki won't harm. The hunter umps in the pit to kill Andre, but is killed himself when he falls on his own knife during the fight and dies. Andre takes the Indian guide with him and Nikki with him on his next adventure. When they arrive at a familiar place, Nikki runs off to find Neewa, who is now a full grown bear no longer interested in playing. He returns to Andre and they take off in the canoe. Nikki, Wild Dog of the North was released on July 12th, 1961. It received favorable reviews, although there wasn't a ton of fanfare when it was released. It was by no means a failure at the box office, but it wasn't a huge success either. It never received another theatrical release, but was presented on TV in 1964. It made its home video debut in 1986. It wasn't until a few years ago that I had seen or even heard of Nikki, Wild Dog of the North. I've never been a big fan of Disney's narrated animal movies, but this is clearly one of the better ones. It does get fairly boring when Nikki and Neewa are off on their own, but the pace picks up again when the hunter enters the story. It is surprising how violent the film can get, especially when you consider that this is a Disney movie made for families. The dog fight scenes are intense and there is blood. And the death of the hunter isn't gory, but is expertly done so that it is hard to watch. I think my main problem with the film is that the ending doesn't make up for the troubles that Nikki endures. He ends up in the same place he was when the film started and while he certainly was wiser as a result, it ends with little celebration. It's not a bad film by any means, but it pales in comparison to some of the other live action Disney films of the era and doesn't leave a lasting memory either. The true strengths of the film are that it is well made in gorgeous locales and the performances from both the human and animal actors are well done. 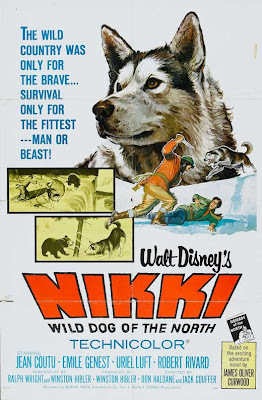 Nikki, Wild Dog of the North was released on DVD in 2000 through a short licensing agreement with Anchor Bay. It has been out of print since 2003 when the deal ended and is one of the few titles that Disney hasn't rereleased on Disney DVD. The Anchor Bay release doesn't have any bonus features and has removed the Buena Vista title card before the film. The film is presented in fullscreen, which was most likely not its original theatrical aspect ratio. The film appears to have received a mild restoration. Some scenes look amazing, while others have excess grain and scratches on the film. The DVD is hard to come by and can be expensive. It is available on iTunes, where is is also presented in fullscreen, but this is the less expensive way to get it. Alex, I just discovered your most enjoyable Disney blog. Would like to contact you about participating on a blog "panel" about Disney animated films at the Classic Film & TV Cafe web site--but couldn't find an e-mail address. If interested, please e-mail me at classic.film.tv.cafe@gmail.com and I will send details. fine picture, will you please paly it for me.? My cousin Virginia owned and trained the dog used in the movie. His name was Smokey. Unfortunately she was not allowed to be named in the film credits and her ex husband's name was used instead. My mom was on location when the movie was filmed.